Welcome To Manchester Telecoms, Telephone Engineer Stockport, City of Mancheater, Oldham, Rochdale, Salford, Tameside, Trafford, Wigan, Macclesfield. Qualified Ex BT Openreach Engineer. Charges up to 50% Lower Than BT & NO VAT ! Qualified Ex BT Engineer, Telephone Engineer Covering The Greater Manchester Area, Telephone & Broadband Installation and Repair, Telephone Extensions, Computer Network Cabling, etc. All our Charges are a Fraction of your service providers & NO VAT. 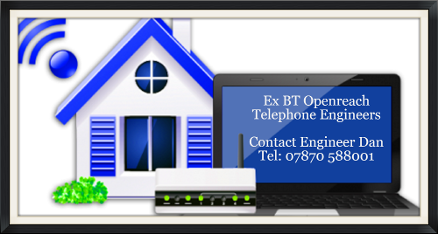 Having a problem with your telephone / broadband line and you require an experienced telephone broadband engineer ?. Are your service providers charges to unacceptably high and they are also charging you an extra 20% VAT ?, Are you getting NO help from there engaged busy call centre ?. Which ever service provider you are with we can help, our services are ALL AT FRACTION of theres & NO 20% VAT. I'm an Ex BT Openreach engineer and all my work will be at the same if not a better quality standard. No Call Centre, you will go straight through to your local telephone engineer. Service providers visit and hourly charges have become far to expensive for common place repairs, eg, BT'S Highcallout plus vat then hourly rate on engineers time also over the top prices on parts. Please contact for residential / business repairs & installations. Our charges are at a Fraction of your Service Providers & NO 20% VAT. Manchester Telecom, Stockport Telephone Engineer covering the City of Mancheater, Oldham, Rochdale, Salford, Tameside, Trafford, Wigan. Telephone Engineer Walkden, Swinton, Whitefield, Middleton, Pendlebury, Lancs, Local Telephone Engineer Trafford, Prestwich, Farnworth, Eccles, Middleton, Westhoughton, Lancashire. Ex BT Engineers.